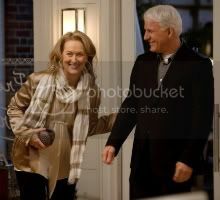 The movie is the story of a divorced mother, Jane (played by Streep), who becomes the “other woman” in her ex-husband Jake’s life. Jake (played by Baldwin) and Jane have been divorced for many years and he has a much younger wife, Agness (Lake Bell). Things get even more complicated when another man, Adam (Steve Martin) begins to fall for Jane. Look for things to get complicated when “It’s Complicated” hits theaters on Dec. 25. I have a good feeling about this movie. This movie looks so good. Christmas, no but the 26th YES who needs to shop anyway!